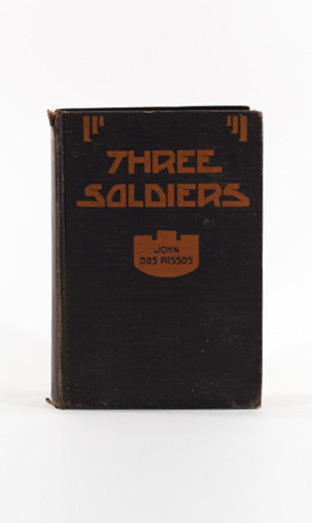 Dos Passos’s second novel, Three Soldiers, publishes after many rejections from publishers and censorship squabbles. The novel is the author’s first artistic landmark. It balances his eagerness for aesthetics with sensitivity to social institutions and character development. In the anti-war novel, Dos Passos introduces his signature satirical voice as he documents the dehumanizing effects of militarization. The three soldiers in the novel endure long waits in the trenches punctuated by heart-thumping firefights filled with poison gas. The merger of the most ancient military strategy—the direct frontal assault—with the latest weaponry—airplanes, grenades, and mustard gas—assures mutual destruction. Each soldier protagonist in the novel hails from a different geographic and social region of America and Dos Passos carefully words each different dialect.